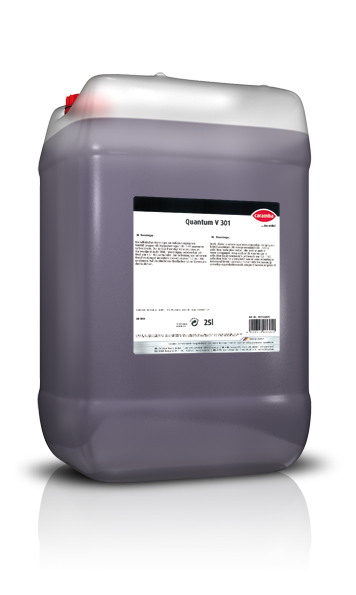 Strongly alkaline powerful cleaner for machinery in workshops and industrial operations. Can also be used as a pre-wash for all vehicle wash facilities. Dissolves easily any oily, fatty and albuminous dirt. Perfectly suitable in areas with very hard water. may only have a short contact with the product. Rinse it off then quickly with plenty of water. Prevent the product from hardening in any case. 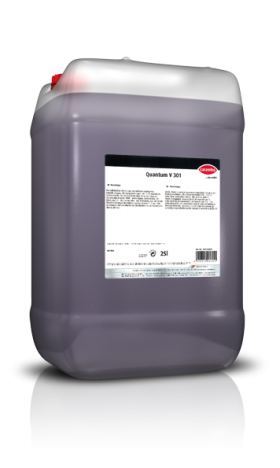 Use Quantum V 301 to adjust the circulating water in the spray arch to a pH value between 9.5 and 10. For use as pre-spray cleaner: Dilute 1:30 to 1:50 with water. Rim cleaning: Manual application: Use diluted 1:10 to 1:20. Spray the cleaning solution from bottom to top. Rinse off using a high-pressure water jet after some minutes of reaction time. 1 Solution with up to 2% product concentration for manual and high-pressure unit application. 2 Solution with up to 20% product concentration for spray cleaning from stubborn oily and fatty dirt. In immersion and ultrasonic baths: dilute 1:10 to 1:100 with water.